California is a jobseeker-friendly state that has implemented state laws in addition to the Fair Credit Reporting Act to help protect the rights of job applicants and employees. If you’re an employer this might make your job a little trickier when you’re running a background report. The California Department of Fair Employment and Housing has provided guidelines for questions an employer may ask a potential employee. Click here to review these guidelines. As a California based company, AGoodEmployee.com has already implemented tools in our system to make your reports California compliant. Due to the sensitive nature of using credit reports for hiring, A Good Employee requires employers to contact us to order a credit report. If you’re hiring for a job position described above, call 855-361-1667. In an effort to promote pay equality, several jurisdictions have enacted ordinances restricting the information an employer can obtain regarding the candidate’s salary history. On October 12, 2017, Governor Jerry Brown signed into law a statute that prohibits employers from seeking salary-history information, (AB-168) including compensation and benefits information, about an applicant for employment. This prohibition applies both to salary-history inquiries made directly by an employer or inquiries made by an agent acting on behalf of an employer. The new statute, which applies to all employers in California, also prohibits employers from relying in whole or in part on salary-history information about an applicant in determining whether to offer employment to the applicant or what salary will be offered. However, if an applicant voluntarily discloses salary history information to a prospective employer, the employer may take that information into consideration in determining the salary to be offered. The statute further requires employers to disclose the pay scale for a position to an applicant who makes a reasonable request for that information. The new statute went into effect on January 1, 2018. Check box to get a copy of the report: if checked, the copy must be sent within 3 business days by the employer or the screening company. If you’re using our service, we’ll send out a copy to the applicant upon request. Register for free with A Good Employee to download a formal notice that fulfills all the notification requirements listed above. Criminal: Arrests and the formal charges shown in an indictment can only be reported for up to seven years in California, and these records cannot be reported if a conviction did not result. A Good Employee will automatically provide seven years of criminal convictions in a report, making it easy to comply with this requirement. Any arrest or detention that did not result in a conviction. Any arrest for which pretrial diversion has been completed. Criminal records that have been expunged, sealed or dismissed. Public sector employers (California state and local agencies, cities and counties) are prohibited from asking about criminal records on employment applications. Public sector employers must review an applicant’s qualifications before inquiring about their conviction history. Register for free with A Good Employee to access a job application that fulfills California’s Ban the Box requirements. Arrest records. 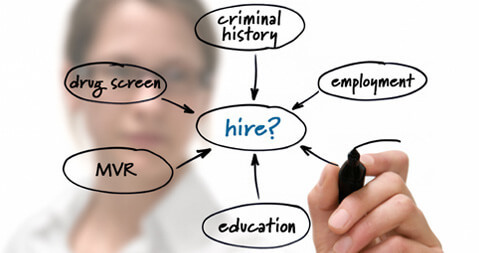 It is an unlawful employment practice for an employer with 5 or more employees to include on any application for employment any question that seeks the disclosure of an applicant’s conviction history, to inquire into or consider the conviction history of an applicant until that applicant has received a conditional offer, and, when conducting a conviction history background check, to consider, distribute, or disseminate information related to specified prior arrests, diversions, and convictions. Adverse Decisions. An employer who intends to deny an applicant a position of employment solely or in part because of the applicant’s conviction history is required to make an individualized assessment of whether the applicant’s conviction history has a direct and adverse relationship with the specific duties of the job, and to consider certain topics when making that assessment. An employer who makes a preliminary decision to deny employment based on that individualized assessment is required to provide the applicant with written notification of the decision. The notification must contain specified information. The applicant is allowed 5 business days to respond to that notification before the employer may make a final decision. If the applicant notifies the employer in writing that he or she disputes the accuracy of the conviction history and is obtaining evidence to support that assertion, then the applicant has additional 5 business days to respond to the notice. The employer must consider information submitted by the applicant before making a final decision. If the employer make a final decision to deny employment he is required to notify the applicant in writing of specified topics. Diversion programs. Employers may not ask about an applicant’s referral to or participation in a pretrial or post-trial diversion program. Juvenile records. Employers may not ask applicants about juvenile records relating to arrest, detention, processing, or adjudication while the applicant was subject to the juvenile court system. California does not consider juvenile court decisions to be “convictions” that employers could otherwise inquire about. Federal Protections for Applicants With Criminal Records: There are two federal laws that protect applicants with criminal records, at least in some situations. The Fair Credit Reporting Act (FCRA) addresses the problem of accuracy. Criminal background checks may include errors. A court or other jurisdiction may omit some data such as information on convictions that have been expunged, incomplete information (for example, failing to report that the person was exonerated of a crime or that charges were dropped), misclassification of crimes, multiple listings of the same offense, and even records that belong to someone else entirely.